With the system, I ended up guiding the taxi driver through streets I’ve never passed even once in my life. And without looking up, I told the driver to stop when I saw in the map that we were very near the hotel. After he stopped, we looked around and saw, less than 50 meters away, the Isabelle Royale Hotel and Suites entrance. The driver was amazed and, privately (I am sure) disappointed he wasn’t able to take us to the hotel via a longer and more expensive route. I would repeatedly use Google Maps and GPS to find my way several times in our stay in Manila. It’s such an amazing development, this ability to get real time rendering of your location through GPS in a mid-level smart phone like my LG P500, which runs Android Froyo. This capability used to be limited to more expensive devices. But with Android, which is backed by Google, you now have a great tool in finding your way through places using a technology that used to be restricted to military use. 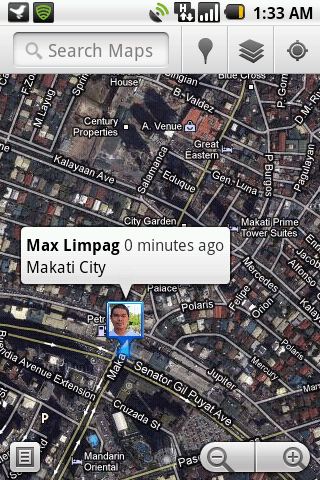 I’ve also used google maps before, pero I’ve used mapdroyd more in the past days. Better in the sense of having the maps offline. Pwede GPS lang, though matagal mag lock. Still better for those na nagtitipid sa load. Thanks for the info. Having the maps offline is a great feature. I’ll try it one of these days.